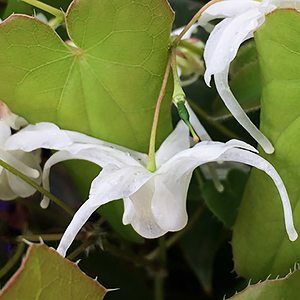 A very attractive white flowering variety, Epimedium Okuda’s White has large flowers for the genus. Very useful as a ground cover plant beneath deciduous or in any shaded area of reasonable filtered light. In these positions the plant will thrive and the foliage and the flowers will add colour through the year. Plant in a humus rich soil in dappled shade. Dig in some well rotted compost and aged cow manure before planting. Mulch around the plant to maintain a cool root run and some moisture. Fertilise each spring with any good organic fertiliser, we use some well rotted compost, blood and bone and a little cow manure, mixed together and applied as a mulch. You can prune these plants back in winter if you wish to give them a tidy up.